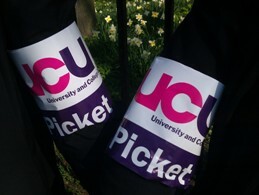 Yesterday, 22nd March 2011, was the first day of strike action by members of the University and College Union in England including lecturers, researchers, admin and library staff from 47 universities taking strike action in defence of their USS pension scheme. Strikes in Scotland, Wales and Northern Ireland took place last Thursday & Friday, and yesterday. 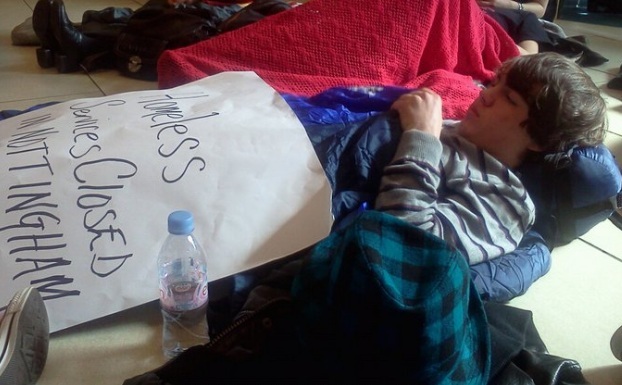 Today, Wednesday 23rd, NSAFC will hold a ‘Teach-out’ with tents outside Hallward Library on the University of Nottiongam main campus from 12 noon and all afternoon to highlight the campaign against marketisation of education, cuts to teaching budgets and to support the UCU strikes. 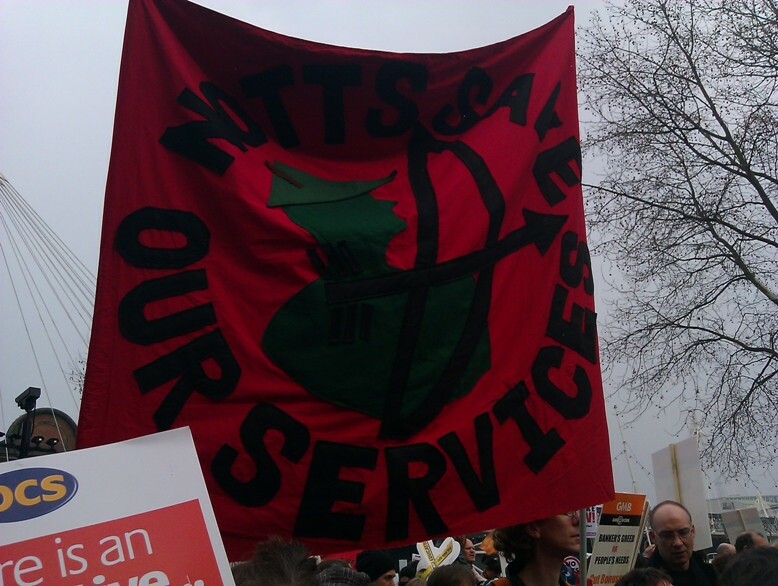 Notts TUC are holding a Budget Day protest against all cuts from 5-7pm in the Old Market Square, Nottingham. On Thursday 24th there will be a UK-wide strike day involving both University of Nottingham and Nottingham Trent University and Further Education colleges. Picket lines will be formed in the morning and there will be a rally in defence of education in the Old Market Square , Nottingham from 11am at least until 2pm. All welcome. 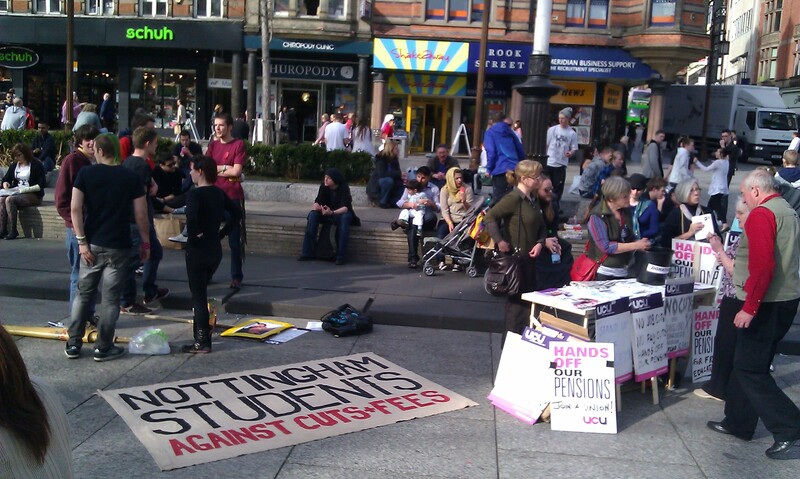 Details here: https://nottssos.org.uk/2011/03/16/university-and-college-strikes-next-week-including-nottingham-city-centre-demo-on-24th-march-2011/. Then at 3.30pm will be the ESOL day of action against cuts to English for Speakers of Other Languages – this open air meeting will also take place in the Old Market Square. Download flyer: ESOL Day of Action flyer 24 March 2011. Help us show the importance of English classes. 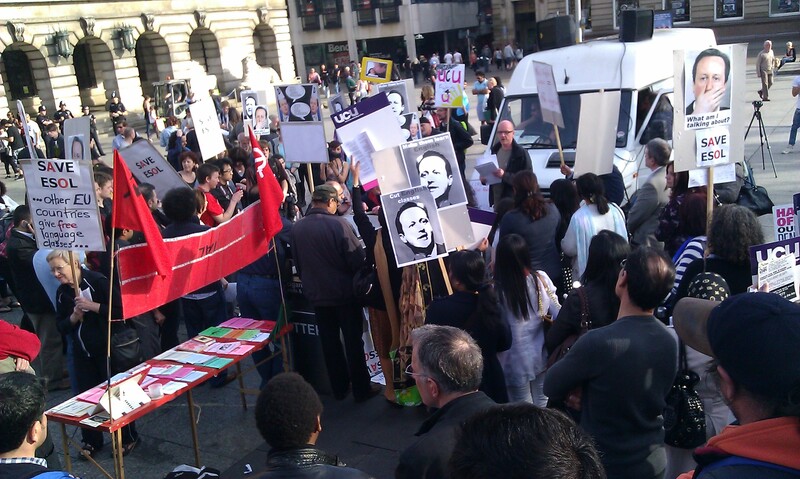 The campaign is growing and this is becoming more than solidarity. 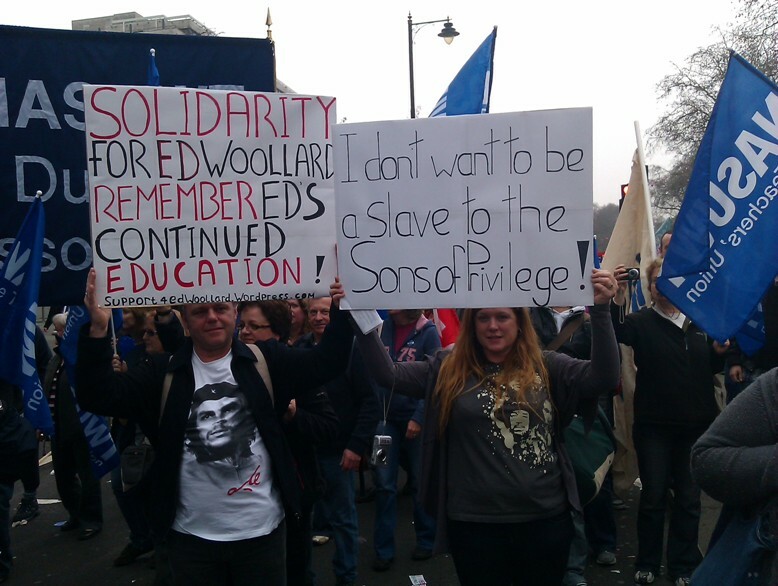 The struggle of students against huge fees rises and cuts to support like ESA is identified with the cuts agenda and the general attack on wages and conditions in education work places. There are a number of unions in universities and colleges such as Unison and UNITE and hopefully the struggle can be broadened in the coming months. The Notts SOS campaigns aims to link up service users and community campaigns as well as workplaces, schools and colleges. 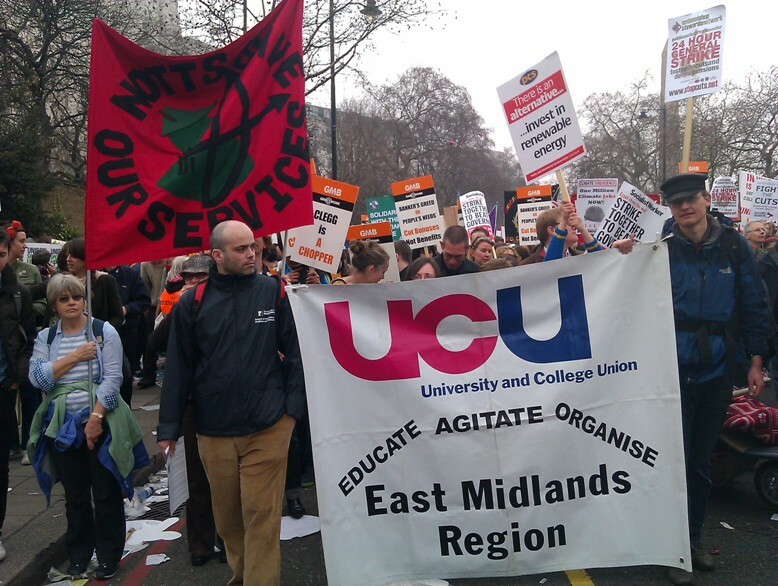 The UCU is taking 3 coaches from Nottingham to London for the ‘March for the Alternative’ on Saturday 26th as are many other unions. Professor Colin Leys and local experts will explain the threat to the NHS from the Health Bill and answer your questions. Date/time: THURSDAY APRIL 21ST, 7pm until 9pm. Venue: MECHANICS INSTITUTE, 3 North Sherwood Street Nottingham, NG1 4EZ. Download poster/flyer: Save our NHS public meeting poster 21 April 2011. 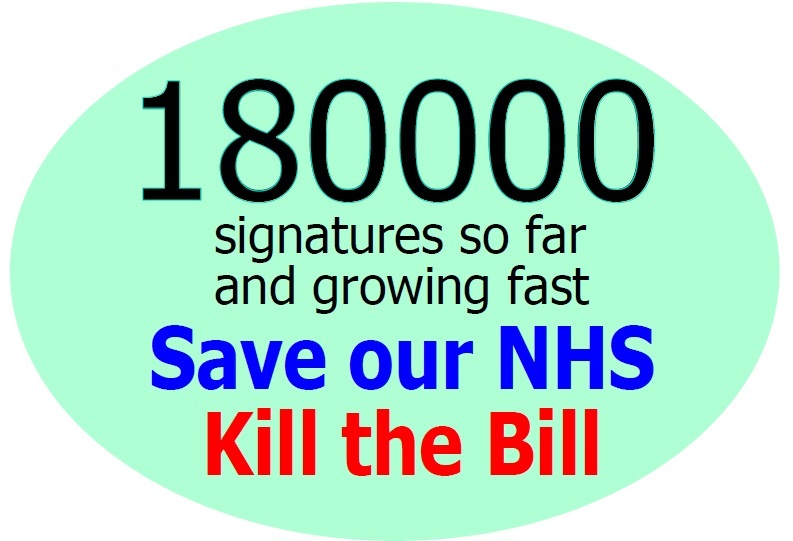 Read: Ten Good Reasons to Kill Lansley’s NHS Bill! 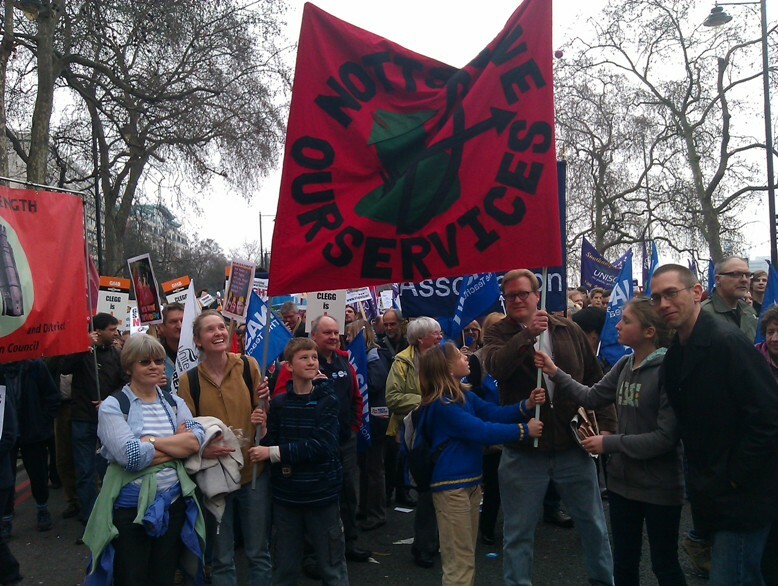 Public meeting organised by: Notts SOS health group, Keep Our NHS Public and 38 degrees. Nottingham staff and students have mounted a united campaign at our local universities and colleges to support University and College Union strike action on the 22nd and 24th of March (Tuesday & Thursday next week in Nottingham). There will be picket lines on the 22nd and 24th and solidarity action by students from both universities and FE colleges via Nottingham Students Against Fees and Cuts. 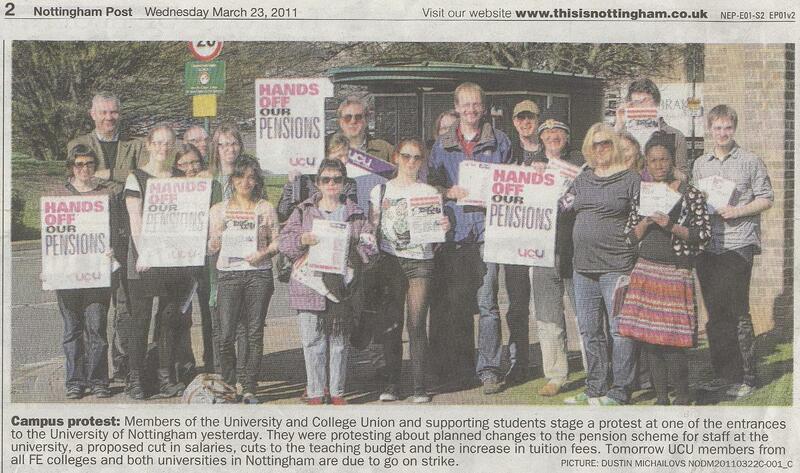 A joint staff/student leaflet has been produced at Nottingham University. Download student side of leaflet. UCU staff side of leaflet. The context of the strike is not only pensions (or forthcoming action on pay and condidion) but the commodification of education. Later in the afternoon on the 24th will be the ESOL day of action against cuts to English for Speakers of Other Languages. Nottingham open air meeting will take place in the Old Market Square at 3.30pm. Download flyer: ESOL Day of Action flyer 24 March 2011. Help us show the importance of English classes. Background: Tomorrow (Thursday 17th March 2011) members of the University and College Union that represents lecturers, researchers, admin staff and part-time students in universities and colleges in Higher and Further Education will begin a week of strike action to defend pensions. The action will begin in Scotland, followed by Wales, Northern Ireland and England (on Tuesday 22nd) before the final UK-wide day next Thursday 24 March. 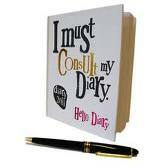 Employers have ignored attempts to meet employers at ACAS to negotiate. Due to continued support and negotiations, the proposed changes have been temporarily postponed but the employers still refuse to meet. See: http://www.ucu.org.uk/defenduss. The union does not claim a monopoly of wisdom on the Universities Superannuation Scheme, only that as one of the fund’s co-founders more than thirty years ago it is dear to our hearts and central to terms and conditions. The union remain committed to negotiations and are willing talk any time, anywhere, to the employers to protect members’ interests, but if they won’t talk we have no option other than to take action.